April 17, 1930, Brescia. The late Elio Zagato learned his trade from the very best. In an awesome demonstration of speed, reliability and advanced design, Alfa Romeo 6C 1750s, all with ultra-light bodies by Zagato, won the first four places in the 1000-mile Italian marathon known as the Mille Miglia. 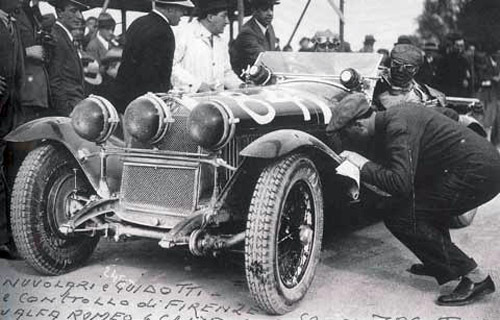 It came as little surprise to master coachbuilder Ugo Zagato, for he had seen it before; Alfa Romeo Zagatos had already won the epic event in 1928 and 1929. Still, by any standards, the 1930 sweep was an astounding feat. Overnight, Alfa Romeo became synonymous with speed, and the Milanese coachbuilder became famous for his weight cheating, “spider” bodywork. “With body by Zagato” would become the catch-phrase of a generation who wanted the latest in beautiful, lightweight competition and grand touring cars. But what exactly was this type of construction, this ultra light bodywork? How was it unique and how did it differ from the similarly famous Touring construction? And who was Ugo Zagato, whose name would become famous throughout the world as a master of light? Ugo Zagato was born in 1890 near Rovigo, Italy. His parents were farmers, but thought that Ugo, one of five children, should become a priest. Ugo had different ideas and at fifteen went to live in Cologne, Germany, to work in a foundry. He returned in 1909 and moved on to Milan where he worked with coachbuilder Cesare Belli while taking drafting courses at night. Instead of being sent to the front when World War I started, due to his work experience, Zagato was told to report to a branch of the large Ansaldo industrial firm, Pomilio Aircraft Works in Turin. The two years at Pomilio proved a cornerstone, for it was there that Ugo would learn aircraft construction, become involved with Italy’s poet/pilot/politician Gabriele D’Annunzio, and form friendships which would prove critical in the inter-war years. But war was followed by massive layoffs as Italy boomeranged from the war economy. Ugo left Pomilio, ready to go it alone into the roaring twenties. Zagato set up shop on the Monza road in Milan, and by 1919 he had enough money to establish “Carrozzeria Ugo Zagato.” He built aircraft parts for his old employer, Pomilio, and constructed bodies on Fiat, Bianca and Itala chassis. This in turn led to the need for a larger premise on Viale Brianza. Aldo Finzi, a Fascist Jewish businessman and pilot who was flying a little too close to the sun, had met Ugo when at Pomilio, and in 1923, Finzi proved to be a suitable source of funding for Zagato’s desire to expand his workshop. Finzi’s close relationship with Mussolini, was a boon for Zagato, whose business flourished with amazing speed. By 1925, Zagato published a truly impressive catalog of RL Alfas with Zagato bodies, and business was apparently, very good and even Mussolini, who was always interested in cars, particularly Alfa Romeo, purchased a RLSS with body by Zagato. A new era at Alfa was heralded by the arrival of designer Vittorio Jano and the new 6C 1500 in 1928. 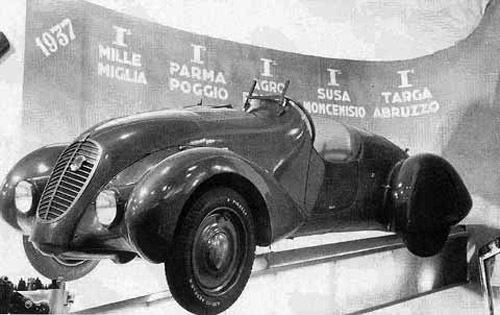 Looking to save weight and do away with wooden frame construction, Ugo Zagato used his knowledge of aircraft construction to build a “Extraleggera” (extra light) body on the 6C 1500, fabricating a metal tubular structure to support the hand-beaten aluminum panels. Ugo Zagato was one of the first to use this type of construction for automobile bodies, which previously were made with wood and fabric. Success was immediate; an Alfa 6C 1500 bodied by Zagato would win the 1928 Mille Miglia, in 1929 a Zagato bodied Alfa 1750 came in first. Zagato’s peak came in 1930 as four Alfa Zagato 1750s swept the board. But while “Alfa Romeo Zagato” would be a name heard in the winner’s circle for the next forty years, it would never get this good again. Ivan Zaremba, one of the three partners at Phil Reilly and Company, has worked with pre war European cars for over thirty years. “The method of wrapping aluminum around a light tubular structure may have started from the fenders, and then adopted to the spartan, competition bodies such as on the Alfa 6c1500. The goal was to get rid of the wood and the weight” said Zaremba. “While Zagato may have been one of the first to construct car bodies in this fashion, it seems that others, such as Bugatti, were also using similar ideas from aircraft construction techniques.” This may be why Zagato did not patent his idea. While Touring was establishing close ties with Alfa, Zagato’s initial successes were not translating into cash for the company. At perhaps the most inopportune time, the firm of Ugo Zagato S.A. was in financial straights and in 1932, a series of transactions left Zagato temporarily out of business. He went to work as a consultant for a firm called Carrozzeria Brianza until 1935. But Zagato’s financial troubles paralleled the Depression, and Zagato lost the momentum and the racing glory, primarily to Touring. In fact, it was now Touring-bodied Alfa Romeos which won the Mille Miglia, and it was Touring who took the Extraleggera idea one step further by creating an ultra lightweight coupe for the new Alfa 2300 “Pescara“. Touring would call the technique “Superleggera” and it would become part of their name. The new factory at Via Giorgini 18 in 1946. In 1935 Zagato’s future looked brighter. 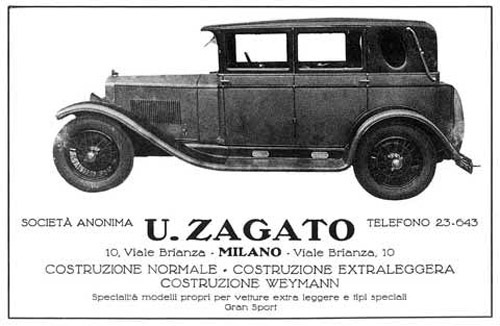 With financing now available from an English-born benefactor, Ugo’s new company, Carrozzeria Italiana “La Zagato” again grew quickly as orders for bodies for Isotta Frachini trucks on one hand and some Caproni aircraft bodies as well. Zagato moved to 27 Corso Sempione, and saving costs by contracting out bodywork to a group of panel beaters known as ‘the little hammers of Milan”, or “Martellini Milanese”. He still built a number of bodies on Alfa chassis, but Ugo Zagato, now with his son Elio, was courting a new clientele, particularly the gentlemen drivers of Scuderia Ambrosiana, who were more interested in racing smaller displacement Fiats and Lancias. The Zagatos obliged, and in 1938, the Mille Miglia would see a total of twenty-eight Zagato bodied cars, but very few were more than two liters in displacement. During World War II, Zagato built build truck cabins under contract from Isotta Fraschini, but on September 18th 1943, RAF bombing totally destroyed the Zagato works. The next three years would prove extremely difficult, making do with working out of a shed leased from Isotta Fraschini. It was not until Elio managed a bank loan in 1946 that a new factory, this time on Via Giorgini was constructed. Trucks and aircraft parts had long been part of the business but the post WWII environment, Zagato gradually began to concentrate on the production of small grand touring cars, the most interesting being the “Panoramica” series, which made use of Plexiglas to increase window areas. 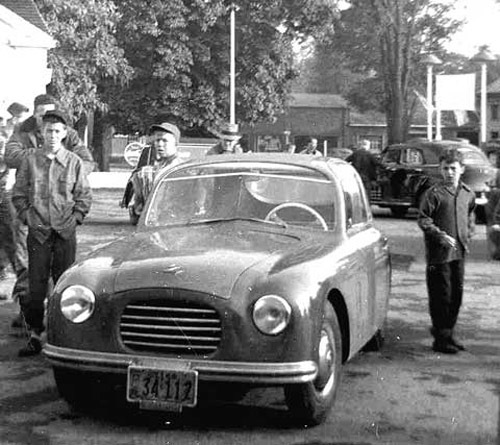 The Fiat Panoramica, seen at Watkins Glen in 1950. Photo by Frank Shaffer. Elio, who was Italian-crazy about racing, became a very competent driver, always winning with the latest Zagato-bodied Fiat or Lancia. The youngest son, Gianni, in the meantime, completed his studies, learned the business and in 1950, when Ugo Zagato reached 60, he turned over the business to his sons, ostensibly retiring. But it was a gradual process, and for years everyone knew who was the real boss. In 1955, Elio suffered a serious car accident and Ugo decided that his sons had better concentrate on running the business rather than racing. With both of his sons now in command, Ugo’s retirement became more of a reality. 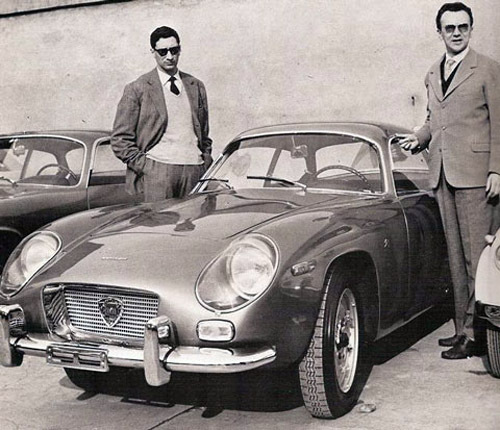 Gianni, at left, and the late Elio, pose with the Appia GTE Zagato in the early 1960s. Gianni left the firm in the 1990s. 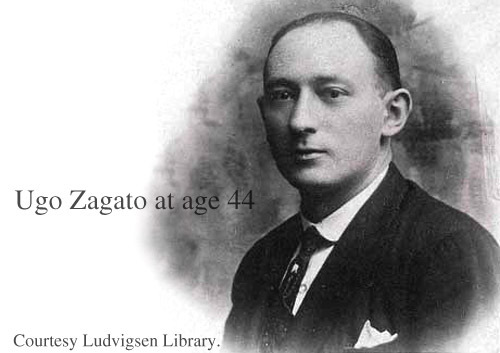 Ugo Zagato died in 1968 at the age of 78, just as the firm was expanding again to a new factory. The famous firm lives on as a design studio, under the control of Ugo’s grandson Andrea. In the year of Ugo Zagato’s death, Enzo Ferrari in a letter to Elio Zagato, recalled the first Zagato spiders. “I remember the first ultra light structures which your father made in 1927…and I think about how much motoring history is embodied in those Zagato spiders made for the RLs, then for the 1500s and the 1750s. It was a glorious series, a product of avant guarde mechanics and brilliant improvisations…” Ferrari’s words were a fitting remembrance for one of Italy’s greatest masters of light. This article by Pete Vack was first published at VeloceToday.com.